Generally, if nutrients can be reduced native species are expected to benefit. None of the treatments tested have made a clear improvement. 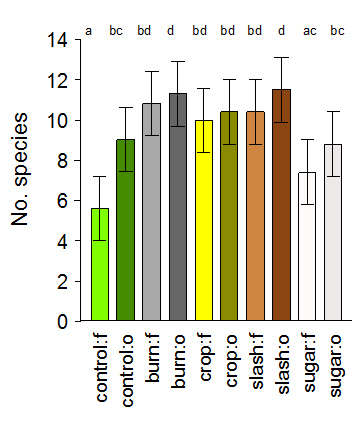 The measured nutrient values at the beginning of the experiment were compared statistically with the composition of plant species at the same time. The number of native species present was smaller for larger concentrations of the plant nutrients Nitrogen, Phosphorus and Carbon. 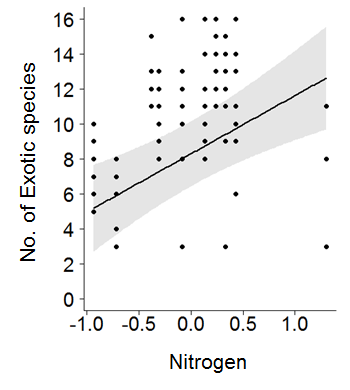 While there was no relationship with the nutrient level as a whole, the number of exotic species was larger for larger Nitrogen concentration in the soil. 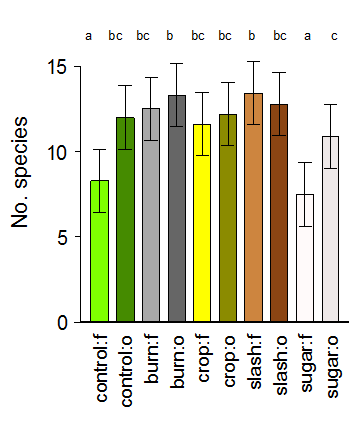 Although the number of native species overall was severely reduced by high nutrient levels, some native species did better at high nutrient levels. 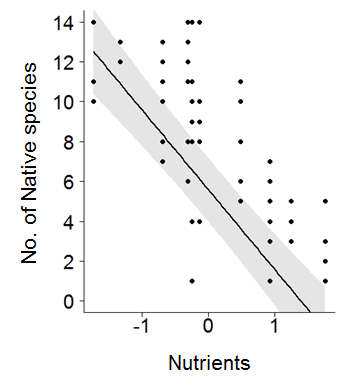 Similarly, although exotic species increased with higher nutrient levels, some exotics did better at low nutrients Some natives do better at high nutrients. The type of nutrient matters. Summary: This finding suggests that while on average it will benefit native species to reduce nutrients, the actual outcome of any attempts to reduce nutrients is likely to depend on whether those attempts reduce Phosphorus and Carbon or Nitrogen. See below for a note on interpretation of the charts. Columns are labelled as the treatment, followed by the letter "f" for fenced (ie ungrazed) or "o" for open (ie grazed). For example, "crop:o" represents the grazed cropped treatment. The letters above the columns indicate whether columns are statistically significantly different from each other. 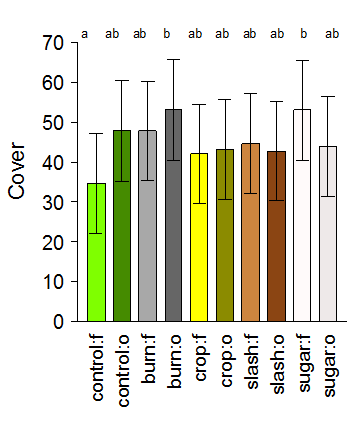 For example, in the effect of treatment on exotic species cover immediately above, "crop:f" and "slash:f" are not significantly different (both have the letter "e" above them), whereas "crop:f" and "sugar:f" are significantly different (because they have no common letters). Disturbance, whether by grazing, fire, slashing or cropping, increases the number of species of both exotic and native plants. 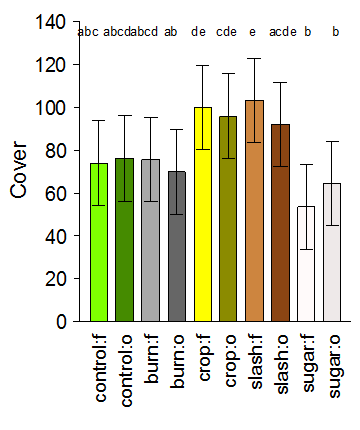 but, if grazing is prevented, adding sugar prevents number of native species declining as much as the exotic species.